A transcendent debut novel that follows a critic, an artist, and a desirous, determined young woman as they find their way—and ultimately collide—amid the ever-evolving New York City art scene of the 1980s. Welcome to SoHo at the onset of the eighties: a gritty, not-yet-gentrified playground for artists and writers looking to make it in the big city. Among them: James Bennett, a synesthetic art critic for the New York Times whose unlikely condition enables him to describe art in profound, magical ways, and Raul Engales, an exiled Argentinian painter running from his past and the Dirty War that has enveloped his country. As the two men ascend in the downtown arts scene, dual tragedies strike, and each is faced with a loss that acutely affects his relationship to life and to art. It is not until they are inadvertently brought together by Lucy Olliason—a small town beauty and Raul’s muse—and a young orphan boy sent mysteriously from Buenos Aires, that James and Raul are able to rediscover some semblance of what they’ve lost. As inventive as Jennifer Egan's A Visit From The Goon Squad and as sweeping as Meg Wolitzer's The Interestings, Tuesday Nights in 1980 boldly renders a complex moment when the meaning and nature of art is being all but upended, and New York City as a whole is reinventing itself. In risk-taking prose that is as powerful as it is playful, Molly Prentiss deftly explores the need for beauty, community, creation, and love in an ever-changing urban landscape. Molly Prentiss was born and raised in Santa Cruz, California. She was a Writer in Residence at Workspace at the Lower Manhattan Cultural Council, the Blue Mountain Center, and the Vermont Studio Center and was chosen as an Emerging Writer Fellow by the Aspen Writers Foundation. She holds an MFA in creative writing from the California College of the Arts. She lives in Brooklyn. "It isn't easy to write a novel about art, and even harder to write a novel about art this good, with this much energy and verve and sense of adventure -- and Molly Prentiss has done it. 'Tuesday Nights in 1980' is much more than an accomplished first novel; it is a beautifully written story of creation and transformation, set against a backdrop of urban decay and political violence. I loved this book." "For those of us who like our novels soulful and brainy, ambitious and deeply felt, Molly Prentiss has given us a first work of fiction to marvel at and then savor. This is a serious young writer in full command of her craft." "Whether her canvas is as broad as the New York City art world in the good old days of glitz and excess, or as small as the quiet, deeply moving connection between brother and sister, Molly Prentiss seems able to render any expression of humanity expertly onto the page. 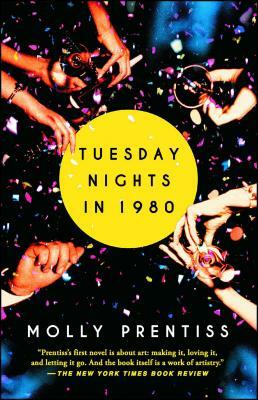 TUESDAY NIGHTS IN 1980 has worlds in it, all wildly appealing, and Molly Prentiss has chops to spare. I can't imagine the soul who won't love this book." "An agile, imaginative, knowledgeable, and seductive writer, Prentiss combines exquisite sensitivity with unabashed melodrama to create an operatic tale of ambition and delusion, success and loss, mystery and crassness. Prentiss’ insights into this brash art world are sharply particularized and shrewd, but she also tenderly illuminates universal sorrows, “beautiful horrors,” and lush moments of bliss. In all, a vital, sensuous, edgy, and suspenseful tale of longing, rage, fear, compulsion, and love. "First-time novelist Prentiss vividly conjures a colorful love triangle set in the gritty, art-soaked world of downtown New York in 1980. Impressive, too, is her ability to create an atmosphere that crackles with possibility as well as foreboding...a bold and auspicious debut." "Tuesday Nights in 1980 is a sweepingly large and profound story about art, love and actualization, cleanly and beautifully composed... A poetic novel of ambitiously profound considerations, a large-scale drama in a series of small, perfectly rendered moments." "We are luckily introduced to three individuals who bravely take the stage, ready to conquer SoHo by storm. Their trek amongst the bright lights is captivating, and readers will be hanging on the edge of their seats." "It's 1980 in SoHo, and in this thrilling, vibrant debut, a synesthetic art critic could make or break [an artist named] Raul. And so could a girl named Lucy. Oh, and his own recklessness, too." "[Prentiss'] writing is as vivid and sensitive as the pensées of her synesthetic art-critic protagonist...[her] descriptions of the eighties art world ring true on both the texture of the work and its go-go capitalist corruption." "Capturing the zeitgeist of a pivotal time and place, this novel is brash and ambitious, with a dash of magical realism thrown in: think Andy Warhol’s legendary parties when they were still underground. Prentiss has created a remarkable debut."